On April 13, 1861 – the shells of Ft. Sumter are heard, sparking the beginning of Civil War, five weeks later while the wedding of Mary Ann Simmons and Joseph Mumford Foy’s only daughter, Henrietta is being planned. On May 8, 1861, young Henrietta marries Dr. Joseph C. Shepard at Poplar Grove. Twelve days later, on May 20, 1861, North Carolina secedes from Union, and the last southern state to do so. On August 21, 1861, the Confederate Congress passes act for local defense and special service. 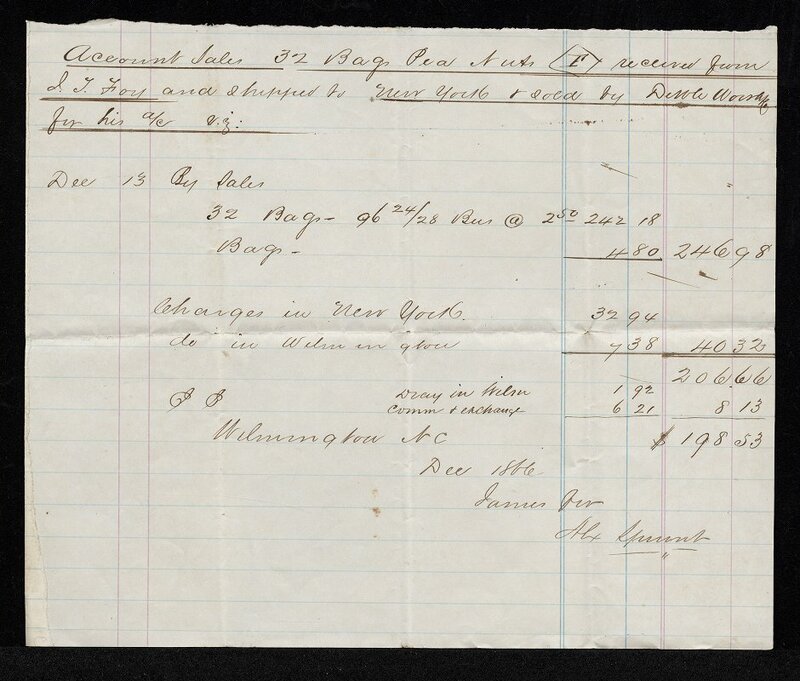 Thus, on October 1, 1861, Company A, originally known as the “Rebel Rangers,” was enlisted at Scotts Hill, New Hanover County, for 12 months service. The company had seven commissioned, nine non-commissioned officers, two musicians and 155 privates; total, 153. Shortly, thereafter, on October 18, 1861, the company was mustered into Confederate service and remained in New Hanover County. Only weeks later, in a nearby training camp, David Hiram contracted typhus and died at the age of 21 in the back parlor of the manor house on June 12, 1862. He was buried at Oakdale Cemetery in Wilmington. With the advancing Union lines and the threat of a yellow fever epidemic that ravaged the city of Wilmington during the fall of 1862, Mary Ann evacuated her children to Owensville, Sampson County, NC. Her widowhood was referenced in a Confederate map listing her as Miss Foy on the property lines of Poplar Grove in Scotts Hill, as seen in the above illustration by William Benjamin Blackford. Also note the location of the Artillery Camp just north of Miss Foy’s home. In late 1864, Mary Ann applied personally to Confederate President Jefferson Davis for an exemption for her second eldest son, Joseph Thompson (J. T.) Foy. She eloquently pleaded for her son’s presence at home to help assist in the management of the plantation. 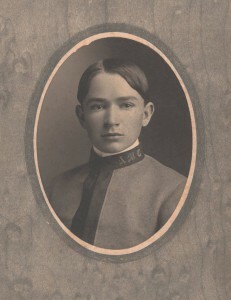 At the age of seventeen, J. T.’s obituary asserts that he took “charge of the large estate and managed same for his invalid mother and younger brothers and sisters.” Though he was granted a civil service position with the Confederate government, the young J. T. remained in Scotts Hill for the remainder of the war. After the war ended in 1865, Mary Ann and her younger children returned to Poplar Grove. 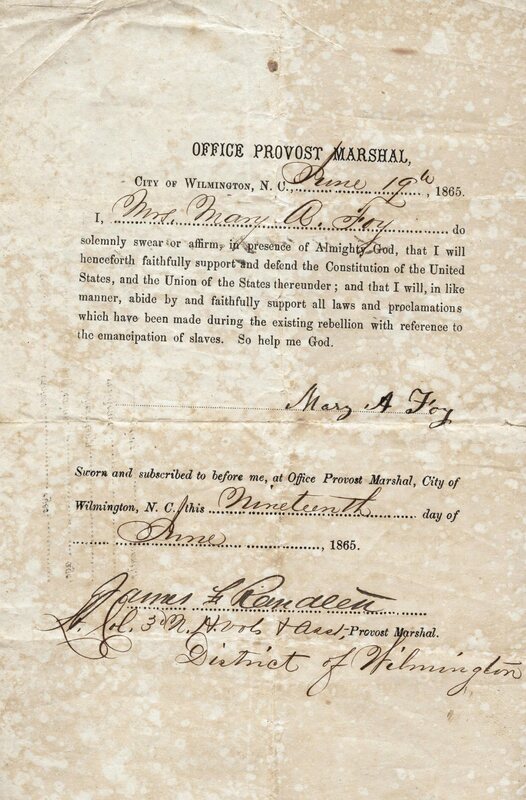 Wasting no time to align herself with the Union, Mary Ann took the Oath of Allegiance on June 19, 1865. 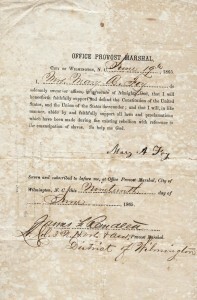 The signed document of which is above & to the right. 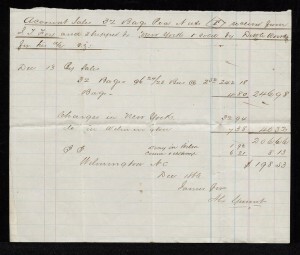 Within only a few short years, The Morning Star noted that in 1867 the “farm under his [J. T.) management prospered and an unforeseen security debt of thousands of dollars was met and cancelled. At the age of 21, Mr. Foy had given the farm a clean sheet and had an accumulation to be divided among the younger boys at their maturity” (“Pender Man Passes Away” April 27, 1918). However, the Census of 1870 lists Mary A. Foy as the head of household, and includes the black and white families surrounding Poplar Grove, more than a dozen of which were emancipated former Foy slaves: 1870 Census of Mary A. Foy. 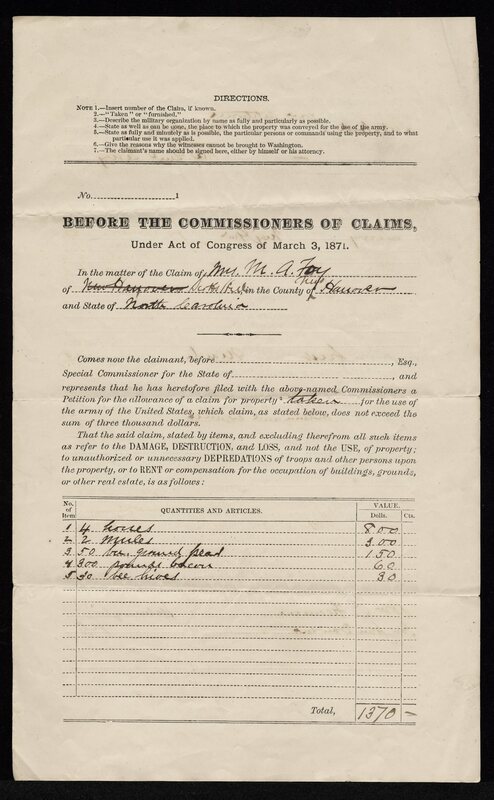 On March 3, 1871, Mary filed a claim with the Southern Commission to be reimbursed for those items Union troops confiscated during the war, including four horses, two mules, 50 pounds of ground peas (peanuts) , 300 pounds of bacon and finally 30 beehives, all of which she valued at $1370, though she did not receive a reimbursement. On the Wednesday evening of November 8, 1871, J. T. married Sarah Eleanora (Nora) Dozier (b. August 23, 1850) of Marion County, SC, a daughter of Dr. Thomas Jefferson Dozier and Elizabeth Emma Gause, both natives of Marion County. The mother of Nora passed away during her birth, and Dr. Dozier married his deceased wife’s first cousin, Sarah Gause. The children of the second marriage included: Thomas, Benjamin, James, Charles, Pamela, Melvina, Elizabeth and Harvey. 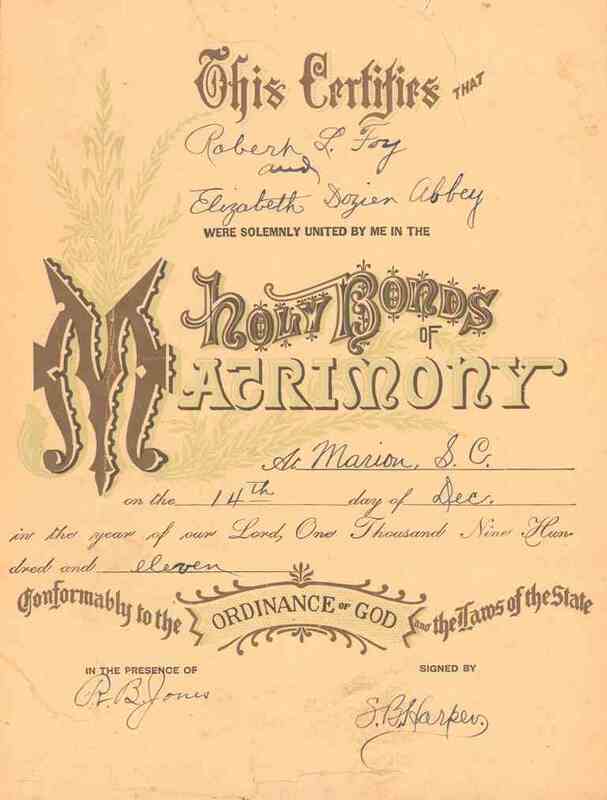 Melvina Dozier (1862-1946) marries Francis Marion Foy (1855-1930), the youngest brother of J. T. Foy. Mary Ann Simmons Foy died on December 24, 1875, in the 54th year of her life. Her 2nd and 5th sons, Joseph Thompson and Francis Marion, lived and worked side by side at Poplar Grove raising close knit families until their deaths. Her fourth son, Henry Simmons, relocated to “Winston-Salem on February 22, 1879, and engaged in the tobacco business, manufacturing plug and twist tobaccos under the firm name of H. S. Foy and Company. He married Mollie Frances White on January 29, 1880, and continued in the tobacco business until 1883. Under J. T. Foy’s direction, the plantation prospered as peanuts were shipped all the way to New York City. Later, J. T. Foy’s “experience in business affairs and his success in life have led to his being chosen by the people of his county to fill important public positions … His part was always that of leader in progressive movements and improvements. He may be credited with an important share of the movement which brought about the construction of what was formerly known as the Wilmington, Onslow & East Carolina Railroad in 1890″ (History of North Carolina). J. T. Foy’s wife, Nora, served as the Scotts Hill postmistress for several years. At 4’11″, she was issued a single shot 22 for protection. Sadly, the deceased children of Mrs. J.T. Foy were removed from Scotts Hill to Oakdale Cemetery on December 27, 1918, to be buried in the family plot of their father. They included a son born in 1878, a son and daughter who both died in 1879; another son in 1883. However, the manor house at Poplar Grove continued to be a gathering place for entertainment. Noted in the Wilmington Messenger of March 24, 1889, “An entertainment for the benefit of Scotts Hill Methodist Church will be given Friday night next, March 29th, as the residence of Mr. J. T. Foy, at Scotts Hill. The affair will be under the auspices of the ladies of the church, and will consist of a magnificent supper to be followed with a festival. The ladies promise a royal time to all who will favor them with their presence, and cordially invite everybody to attend. Doors open at 7:30 p.m.” (Reaves 9). The September 7th 1891 edition of the Wilmington Star News announced that “Joseph T. Foy, chairman of the Pender County Board of Commissioners was elected president of the County Board of Health” (Reaves 12). 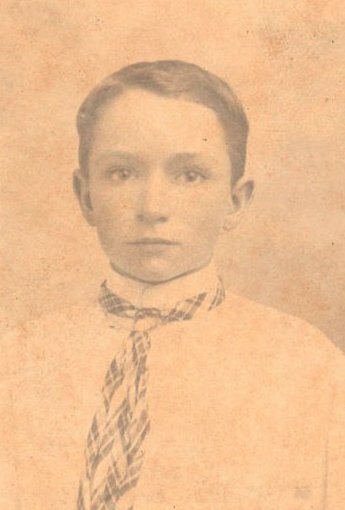 Since J. T. and Nora had no surviving children, in 1895, they adopted their nephew, Robert Lee Foy, Sr., son of Henry Simmons Foy, Sr. of Winston Salem and younger brother of J.T. Foy. The family ties were close, as the Wilmington Star edition of August 10, 1900, indicates: “Mr. Henry Simmons Foy, Jr. [Robert Lee Foy’s older brother], who has been here visiting friends and relatives for three weeks, has returned to his home at Winston-Salem, N.C.” (Reaves 19). Active in local government, J. T. expanded his political ambitions to the state. “In 1901,” The Morning Star notes that “he was elected to the state senate from Pender and Duplin counties and for three terms he was a member of the lower house of the general assembly” (Reaves 32). The Wilmington Messenger in its April 26, 1904, edition describes “the big white home with broad stairway leading to the second story with hospitable doorway and big curtained windows, and a circling carriage drive typical of a Southern plantation home, with its spreading oaks four and five feet through, and poplars and pines tower 80 feet high. Beautiful Jerseys add coloring to the lots at the barns, where big oaks grow, and wells of crystal purity are found in the shade; cultivated fields extend beyond the big vegetable gardens, and wood horizon the scene. This is the home of the Honorable Joseph T. Foy, who was born here, and so was his father, Joseph M. Foy, and his grandfather, James Foy, lived on the place half his life. It is worthy of note that Cornelius Harnett owned a part of the present place which encompasses 815 acres, but Mr. Foy owns about 1,500 acres, including splendid timber. The big house looks as if it was finished yesterday, but it was built 55 years ago. It has eleven rooms and twelve big fireplaces, and is the embodiment of peace and comfort. Therein for half a century has been Scotts Hill post office. Mrs. Foy looks after Uncle Sam as well as her own household, with great ability … His farm foreman, D. R. Ornsby, has been with him a dozen years and raises about everything from peas to peanuts, and Mr. Foy is the champion sweet potato grower. 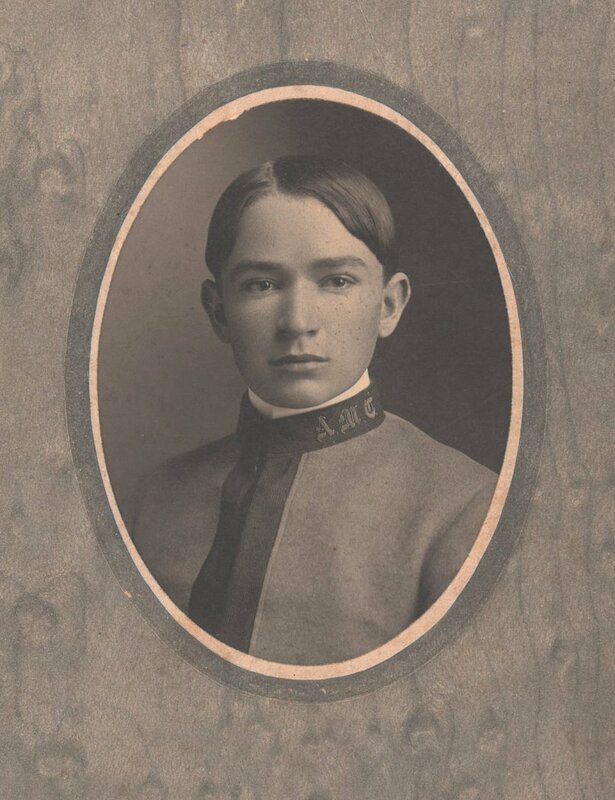 Mr. Foy’s nephew, Robert Lee Foy, is a young gentleman of excellent promise, who will go to A. & M. College [State Agricultural and Mechanical College at Raleigh] this fall” (Reaves 22). 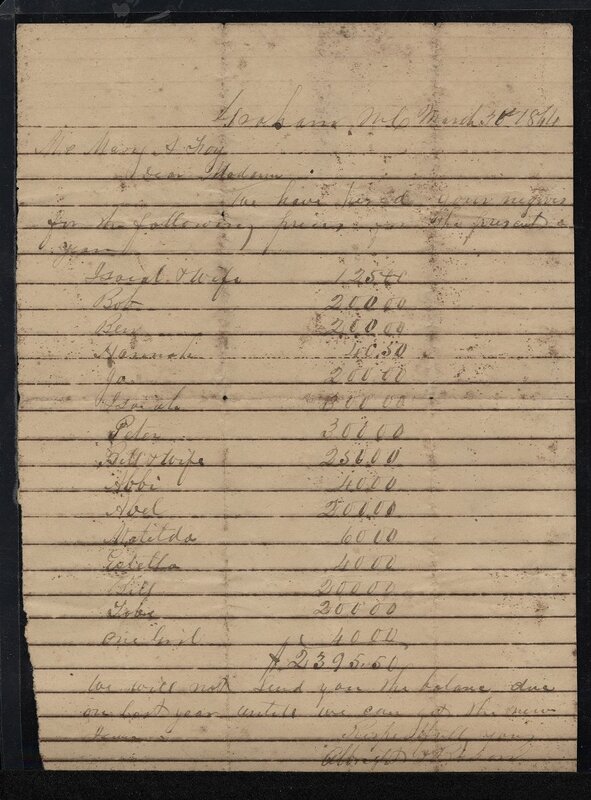 Providing their nephew, Robert Lee Foy, Sr., a college education, he would later assume entire charge of the plantation, including the supervision of the twelve or so tenant families living on the property. It is important to note that “the lots” in the above-referenced article refer to the group of tenant houses located behind the the “big house.” The black residents of which are also listed in the 1910 Census of J.T. Foy. These tenant farmers were also accompanied by local domestic servants who tended to the Foy family and helped prepare the house for small and large, private and public, family celebrations as well as cultivate and harvest the large expansive fields between the two brothers (J.T. and F. M. Foy) farms. 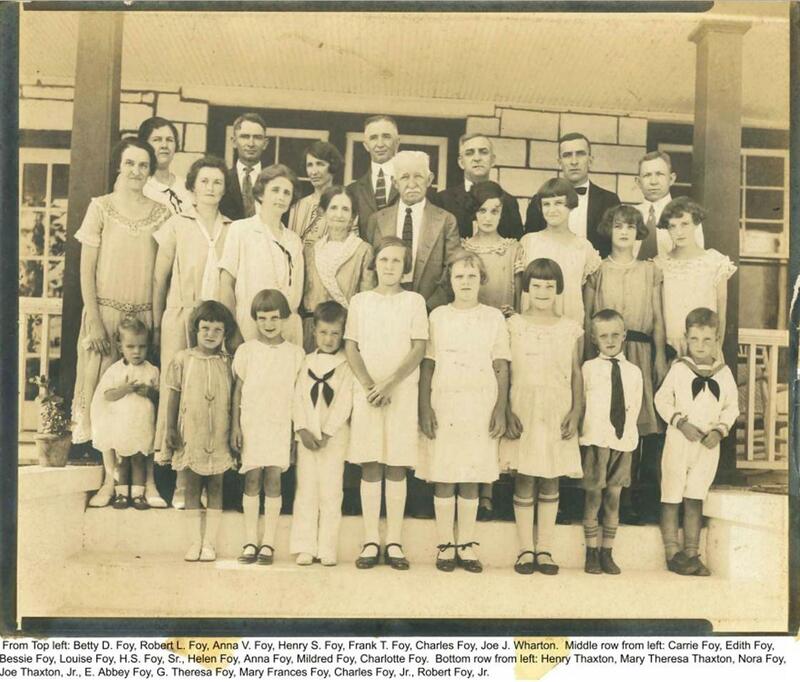 Such celebrations included regular family reunions, the location of which rotated between here and Winston-Salem. The Wilmington News Dispatch on August 22, 1910, announced that “A reunion of the Foy family was held at Scotts Hill today. It is estimated that about fifty of the family and their descendants were at Scotts Hill for the celebration and it is needless to state that the occasion was thoroughly enjoyed by everyone. Messrs. F. M. Foy and J. T. Foy at Scotts Hill. There were also present, a brother, Mr. J. W. Foy and sister, Mrs. Henrietta Shepard, of Wilmington. The celebration was held at the home of Mr. F. M. Foy. At midday a fine dinner was served and the splendid feats of good things was discussed with real enjoyment. The pleasant hours were present with reminiscences and stories and the occasion certainly proved to be one of real enjoyment” (Reaves 25). 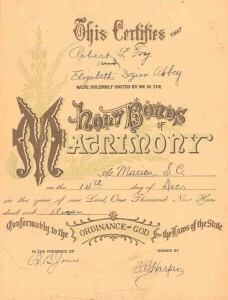 On December 14, 1911, Robert Lee Foy married Elizabeth Dozier Abbey, a niece of his Aunt Nora’s. She was only 19 years old and soon pregnant. However, their first child, a girl, born and died on the same day of September 3, 1912. No doubt, Aunt Nora was a sympathetic confidant to the grieving young wife. Two years later, Elizabeth Abbey Foy was born on October 30, 1914, and another daughter, Gertrude Theresa Foy, was born on August 16, 1916. Shortly thereafter, the Morning Star of Wilmington announced that “J. T. Foy , for many years one of the most prominent citizens in Pender County and well know in Wilmington, passed away yesterday morning at 9 o’clock at his home at Scotts Hill. His death will be mourned by a wide circle of friends throughout eastern North Carolina. Funeral services will be held from the residence tomorrow morning at 11 o’clock and the interment will be in Oakdale Cemetery, this city (“Pender Man Passes Away” April 27, 1918). 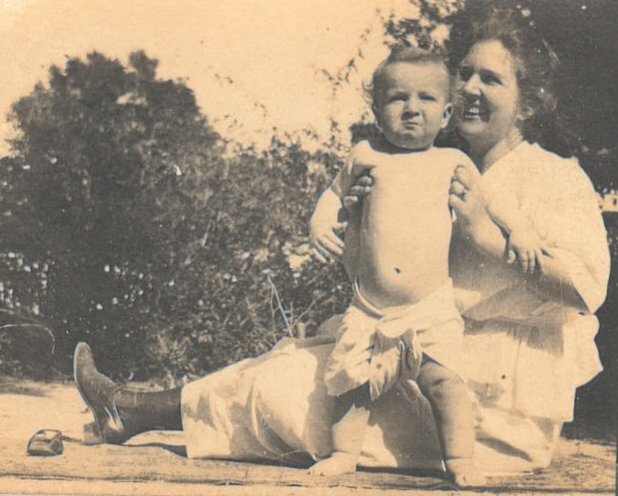 Elizabeth Dozier Abbey Foy with son, Robert Lee Foy, Jr.
After the death of J.T. Foy, the care of his widow, Nora Dozier Foy, continued under their nephew Robert Lee Foy and her niece, Elizabeth Dozier Abbey Foy. Robert Lee Foy, Jr. was born on October 2, 1919. Aunt Nora remained under the care and in the house of the growing family until she died on January 12, 1923; however, not without controversy. On June 6, 1923, the Wilmington News Dispatch disclosed that “The heirs of the late Joseph T. Foy and Nora D. Foy have filed suit against Robert Lee Foy and Elizabeth A. Foy in an effort to break the will of the late Mrs. Nora D. Foy over contention of properties located here and said to be worth approximately $75,000. 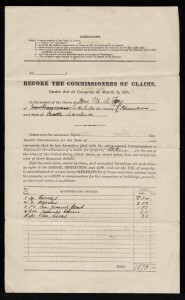 The shift is based on the grounds that the will of the late Mrs. Foy was made with the intention that the will of her husband would be carried out and that her wording had been misconstrued by Robert Lee Foy who, under the liberal interpretation of her will, is the principal beneficiary and who is now in possession of the Foy properties in Wilmington … Mrs. Foy’s will disposes of much personal property, including jewelry and directs that a piece of land at 710 South Third Street be sold and the money derived from the sale, together with money she had on deposit in the Wilmington Savings and Trust company, be used for the erection of an old ladies home. The remainder, not mentioned otherwise, is left to R. L. Foy and wife, Elizabeth, who the donor says cared for her during her widowhood” (Reaves 36). In the May 26, 1924, edition of the Wilmington News Dispatch, Elizabeth’s own father, “William Chester Abbey, 75, died Saturday night at Scotts Hill … the funeral was conducted from the residence of Mrs. R. L. Foy. Mr Abbey was a native of Brooklyn, N.Y.” (Reaves 36). She was pregnant with child and gave birth to a second son on June 9, 1924, only two weeks after the death of her father. Devastatingly, the baby died two days later, on June 11, 1924. They had named him Joseph Thompson Foy. Their only son, Robert Lee Foy, Jr., was the last generation of Foys to operate the farm. Block, Susan Taylor. Cape Fear Lost. Charleston, SC: Arcadia Publishing, 2005. Brown, Joseph Parsons. The Commonwealth of Onlsow – A History. New Bern, NC: The Owen G. Dunn, Co., 1971. Kellam, Ida B. The Wilmington Town Book. Raleigh, NC: Division of Archives and History, North Carolina Department of Cultural Resources, 1973. Print., 250 pages, p. 70. McKoy, Elizabeth. 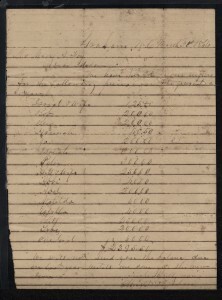 Early New Hanover County Records. Wilmington, NC, 1973. Onslow County Heritage – North Carolina. The Onslow County Historical Society. Jacksonville, North Carolina, 1983. Reaves, William. Reaves Collection. Series 1, v. 26. 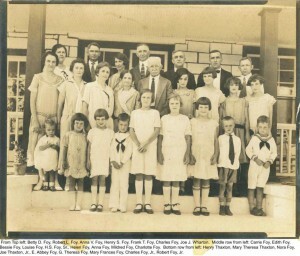 Foy thru Fussel Family History. New Hanover County Public Library, Wilmington, North Carolina, 2003. 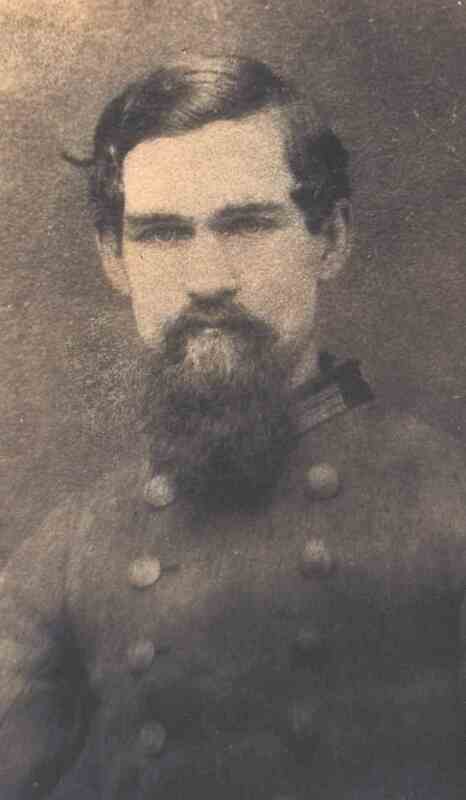 Lt. Col. Henry Rhodes, Jr.